Assign this code to TSRichViewEdit's OnPaintPage event. The code draws line numbers at the left margin. Numbering is restarted on each page. Last edited by Sergey Tkachenko on Fri Oct 02, 2015 9:42 am, edited 1 time in total. Oh, I saw it only now - thank you! I think we will add line numbers as a built-in option in TSRichViewEdit. Is it possible to do the same for TRichViewEdit ? Do you mean line numbers on pages (when printing using TRVPrint) or line numbers directly in the editor? Drawing line numbers directly in TRichViewEdit would be very inefficient. Line numbers are not stored, they are calculated on drawing. In the ScaleRichView example, numbering are started at the page beginning, so calculation is simple. In TRichViewEdit, we would need to iterate each time from the beginning, it is slow. In TRVPrint, it is possible, although, unlike ScaleRichView, it does not have documented methods for it. 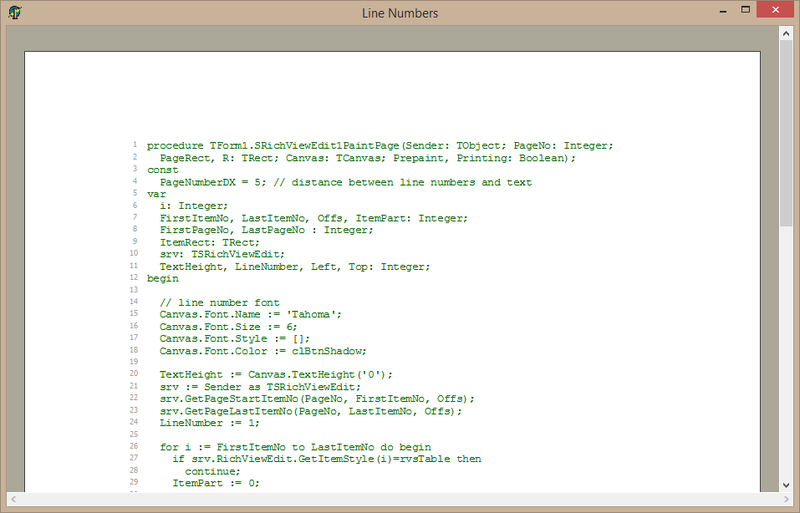 If you need line numbers in TRVPrint, I can make an example. Sergey Tkachenko wrote: Do you mean line numbers on pages (when printing using TRVPrint) or line numbers directly in the editor? I mean line numbers directly in the editor. I think it's good feature that makes reading/writing and navigation more comfortable, also it can be optional as custom panel, or just for plaintext mode. To make it a standard feature, line numbers must be stored in a document. Otherwise, they need to be calculated on painting. For a page, it's not critical, because pages have a limited count of lines. But for a document containing hundreds of thousands lines, calculating line numbers on painting is unacceptable. So, until internal representation is changed, this feature will not be added.